President Trump started off his Monday morning in style, tweeting that he has the “absolute right” to pardon himself for any crime. On August 5, 1974, Mary Lawton, the Acting Assistant Attorney General, examined the question of whether the president can pardon himself. The president at the time was Richard Nixon. “Under the fundamental rule that no one may be a judge in his own case, the President cannot pardon himself,” Lawton wrote. Lawton’s analysis was analyzed last year by a trio of legal scholars for the Washington Post, including the White House Counsels for Presidents Obama and Bush. Though the pardon power dates back hundreds of years, the scholars writing in the Post were unable to find a single case of a self-pardon recognized as legitimate. “Even the pope does not pardon himself. On March 28, 2014, in St. Peter’s Basilica, Pope Francis publicly kneeled before a priest and confessed his sins for about three minutes,” they wrote. There are some legal scholars who do believe the president can pardon himself. Writing Monday in USA Today, law professor Jonathon Turley makes that argument. The president cannot pardon himself. Even if he tries it and the courts allow it, which is unlikely, he would almost certainly be removed from office immediately. 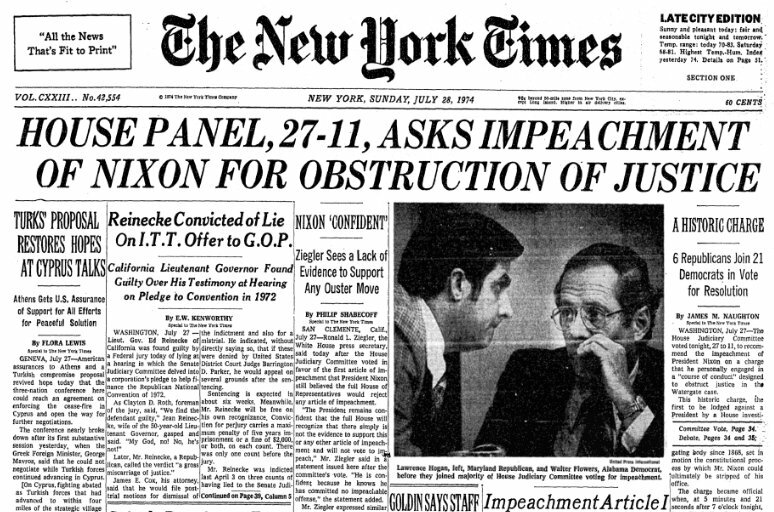 Four days after Lawton issued her memorandum, Nixon resigned.